Although we love seeing wildlife in and around the property, there are certain animals that we do not want around because of their destructive nature. Deer can be quite destructive to our ornamental gardens and especially our hostas. We have never had an issue with deer on our property here at New Hampshire Hostas, which is quite amazing to some as we are surrounded by woods. We do have two small dogs, Abby & Chloe, that mark their territory around the property and we are continually active on the property. Nonetheless, deer are a major problem for gardeners. Here are a few deterrents that can help keep the deer away from your favorite plants. All of these are organic and do not harm wildlife in any way. Milorganite: Milorganite is an organic nitrogen fertilizer derived from heat-dried microbes that have digested the organic material in wastewater. The odor from milorganite is effective at keeping deer away from your gardens. 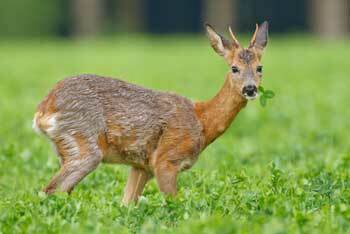 Another effective way to deter the deer is by putting harsh tastes on the leaves of the plants you want to protect. Deer Repellants: There are commercial Deer Repellent products available that are foul smelling and tasting. Follow the directions for proper application. Cayenne Pepper: Many customers make their own deterrent by mixing cayenne pepper with water and dish detergent. The mixture can be applied to the leaves and anything that takes a bite will not want another bite. Most of these deterrents have a limited life span and will need to be reapplied. Also, we recommend using more than one and switching them around so that the deer do not get comfortable with any of them. Another way to keep the deer off your property is with deer fencing. This is typically an 8 foot high plastic mesh fabric that is applied around the area you want to keep the deer out. We have heard good results from this product but is not practical for most homeowners.